VEX provides a fun way for students to learn core subjects through robotics. 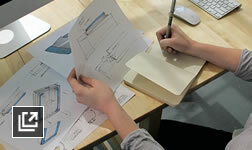 Software from Autodesk supports this project-based learning approach. Autodesk provides educational licenses for free* software to qualified educational institutions associated with VEX Robotics. To request free software for your organization, sign in or create an account for the Academic Resource Center. Analyze design concepts with a simulation app. Develop functional moving mechanical systems. VEX brings the coolness of robots and the magic of competition into the classroom. It’s the largest classroom-based robotics competition program in the world. 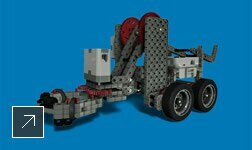 Check out the Autodesk VEX Robotics Curriculum. Autodesk Digital STEAM is a free resource focused on teaching students how to use the design thinking process. Projects are arranged by software, difficulty, time, and subject to help find a project appropriate for your needs. Get started now. The VEX Kit of Parts provides you with digital models of all the parts included in the VEX Classroom Kit. The Kit of Parts for Autodesk® Inventor is available in 2011, 2012, and 2013 versions. There are also Imperial and Metric datasets available for each version. Download your kit of parts. The download time is estimated at 5 minutes. The REC Foundation and Autodesk are pleased to partner to offer one (1) $5,000 non-renewable scholarship to one (1) high school junior or senior intent on pursuing a degree related to science, technology, engineering and mathematics in college. The award will be presented at the VEX Robotics Competition World Championship in April 2014, but the student does not need to be present to win. Learn more. The VEX Robotics webinar series offers student resources and design education. Both mentors and students can benefit from the series. Learn more.